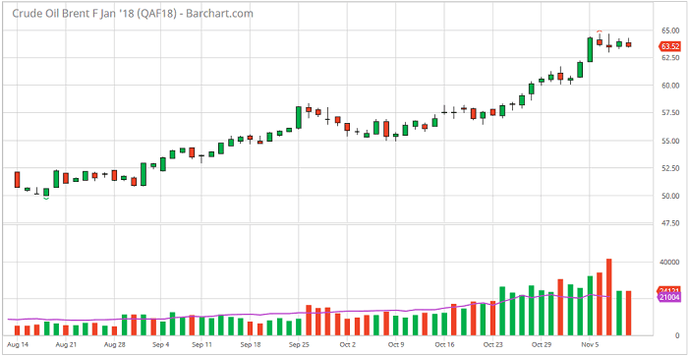 Market Leader : News :: What’s the Fair Price of Crude Oil Today? What’s the Fair Price of Crude Oil Today? For many economies out there, especially those dependent on the export of crude oil, oil prices have always been a major indicator to monitor. These days, the international expert community is divided over the future of the global oil market. According to an observer for Al-Eqtisadiya, the 2017 international oil price report reads that Brent oil did manage to stay above $60/b for 10 consecutive days. This fact changed the oil exporters’ market expectations. Today, many of those experts in oil-exporting countries predict a move up to $70/b in the near future. While this may be a really viable and likely scenario, the OPEC clarifies that they have never set any specific prediction regarding oil prices. However, international experts believe that a move up to $60/b used to be one of the key goals for the oil cartel within the scope of the OPEC+ deal. As for the mentioned oil agreement, it focuses mainly on restoring the balance in the global market of crude oil. A few weeks before the OPEC summit scheduled for November 30th in Vienna, some experts already started justifying the $70/b forecast. On the other hand, any further success achieved by the OPEC in pushing oil prices higher is only capable of fueling a new wave of shale oil production in the United States, which is now a major oil player as well. In the middle of last week, oil prices set a local low. NordFX experts explain that this retracement was triggered by a drop in the import of crude oil to China. However, this retracement was suspended by a major support level backed by the OPEC+ agreement. The whole point is, the participants are planning to extend the agreement for the entire 2018. Also, the drawdown can be partially explained by profit-taking. Some of those who went bullish on crude oil decided to reduce their exposure and take profit, especially as the prices hadn’t been that high for quite a while. At the same time, Saudi Arabia started a major anti-corruption campaign and the U.S. crude oil inventories shrank a little bit last week. By the way, some experts think that these were some of the key factors that pushed oil prices higher. For instance, Morgan Stanley has improved their 2017 Brent forecast up to $62/b. It’s interesting to note that the previous 2017 forecast predicted $55/b. The OPEC report is said to have improved the cartel’s expectations and the OPEC+ deal is probably going to be extended. The OPEC is planning to make the global market less sensitive to the geopolitical situation in the world, but some experts say that’s just a dream that cannot be put into practice in today’s world. The thing is that politics and the world of energy carriers are closely connected.